Text in Niederländisch, Englisch und Deutsch von Wim A.L. Beeren. Sigmar Polke is one of the world’s most revered and influential contemporary artists. This handsome book documents Polke’s recent work, which continues and deepens the artist’s famed explorations of how images are made, used, and thought about in our media-dominated culture. The works also pose intriguing questions about how the eye and mind become crucial players in the perceptual game we undertake daily. Using topical subject matter such as the ongoing conflict in Afghanistan and the Middle East and the everyday presence of guns in American life both for its inherent content and metaphoric possibilities, Polke has created a cohesively thematic yet ingeniously diverse group of monumental paintings and large-scale drawings. The source materials for these images are often drawn from American and European newspapers, magazines, and books. All of this work by Polke reflects a fiercely intelligent yet remarkably accessible interpretation of how we perceive and misperceive the social, political, and aesthetic worlds that we live in. In the text, Charles Wylie discusses how Polke’s recent work presents a coherent visual essay on the literal and symbolic construction of images. Noted art critic Dave Hickey provides an interpretive essay on the artist and these new works. 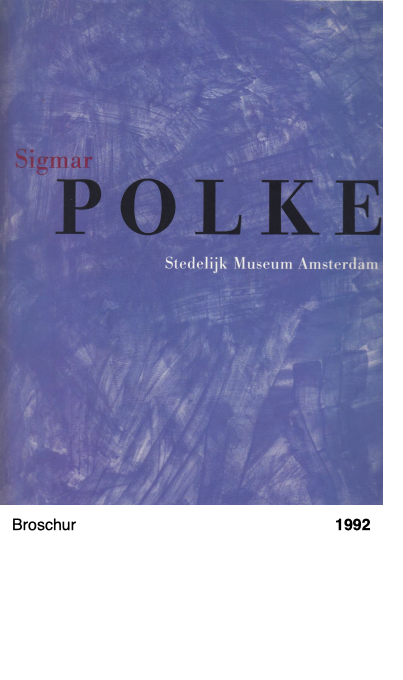 Both essays are interspersed with a valuable compendium of Polke’s source materials.